I arrived on Paros and my Aunt Marisa was all over me. She’d seen the windchime I’d given little Zefi, but he’s already been subjected to months of “Mom, come see what big Zef did”, so she was prepped and ready. “Come and see what I have for you to make”, she said, and proceeded to show me her collection of STUFF. The doilies she’s had for years that her mother made, the old curtains, the collection of ribbons and things that will come in handy one day…. Did I ever mention my nieces? I’ve never had kids, right? But I have tons of nieces and nephews thanks to my brother and the fact that I have 23 first cousins. 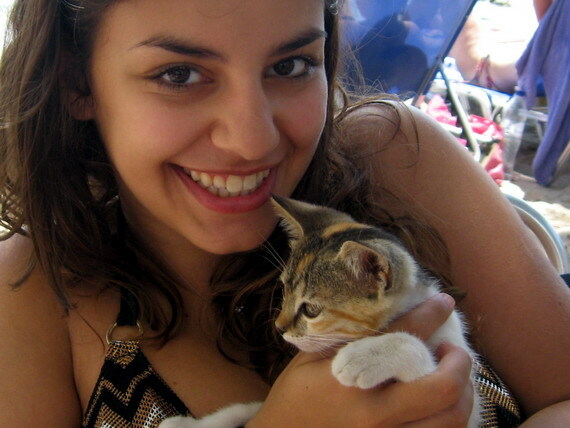 Little Zefi’s daughter Marouso way more beautiful than me… except for the fact that she’s a mad animal lover. Yesterday at the beach she found a kitten and brought it home. Little Zefi gave me the filthiest look. Its all my fault. Those are my genes popping up in the next generation. I feel quite pleased with myself. I’ve managed to create Zefi carbon copies without having to worry about pregnancies or changing nappies! But I digress… I was talking about my Aunt Marisa and her plans to harness my creativity to her own ends. The other night my hands got bored. I’d already bought some basic tools – a small set of pliers, some fine wire, a hot glue gun. 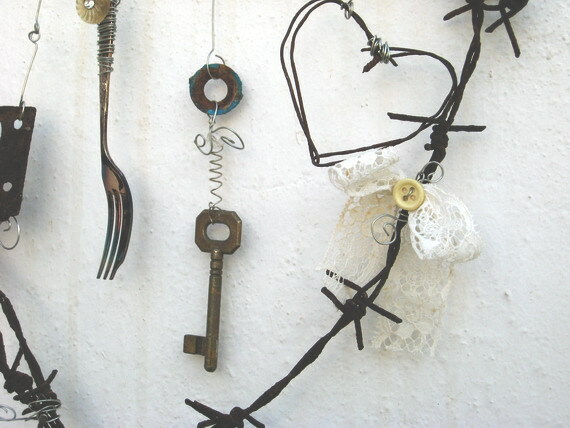 I already had a box of odd and ends, bits of lace, a million buttons from the 50s and 60s, some old dessert forks, some rusty stuff I’d scavenged. 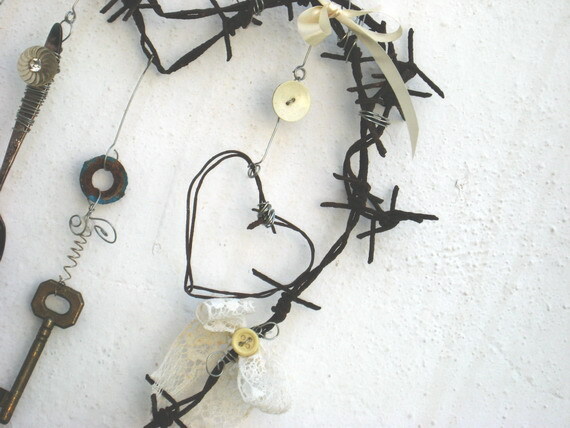 And a piece of barbed wire I took off a fence on the way to town. 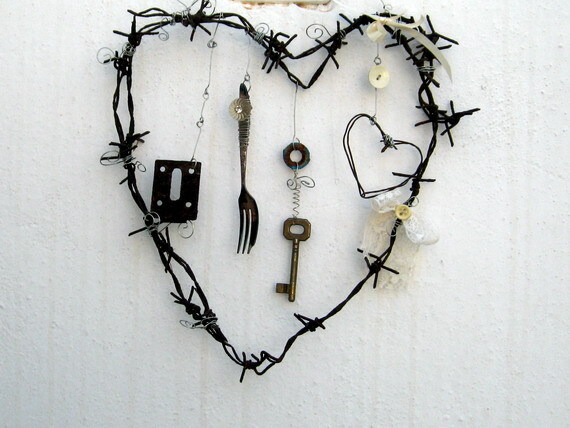 This heart hangs outside Zefi’s bedroom door: barbed wire, some old lace and ribbon, an old key, a small fork, rusty washers and a rusty door strike plate. I added some dry wildflowers as well this afternoon. Its a pity I don’t have this ‘team’ with me in Tasmania. I could have a ton of stuff to work with if I had Aunt Marisa and little George foraging for me. Just in case you’re wondering, I’ve already put in my claim… Aunt Marisa is leaving me her collection of STUFF in her will. I guess I better get to work on the other projects awaiting me. I have to pay for my room somehow, right? 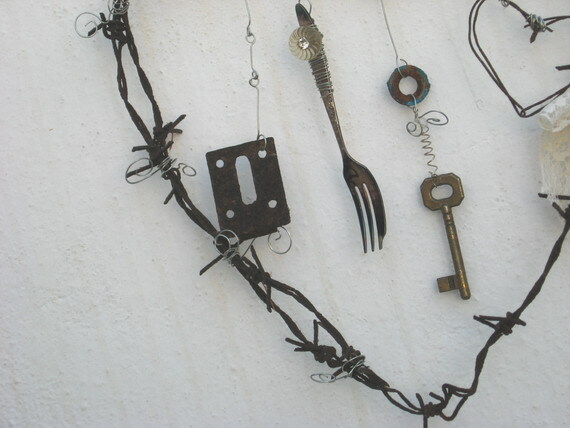 This entry was posted in DIY, greece, rustic, thrifting by zefiart. Bookmark the permalink.